Inspired by the latest Alissa Cohen DVD I have been watching, I feel I’d like to actually try going 100% raw for at least 30 days. Up until now I have done 2 weeks 100% raw and mostly am about 70% – 80% raw but have not actually gone 100% raw for an extended period of time. When I do eat cheese or pasta or baked goods it does make me feel bloated and no where near as light as when I eat lots of raw… I think it is time to put the challenge out there and just do it! I guess the hardest and most challenging aspect is that I have a partner and 2 children who won’t go 100% raw so I am always going to need to make my own food and also make something for them. It is going to be really important I do as many ‘simple’ things as possible and have prepared food ready and available in the fridge at all times! 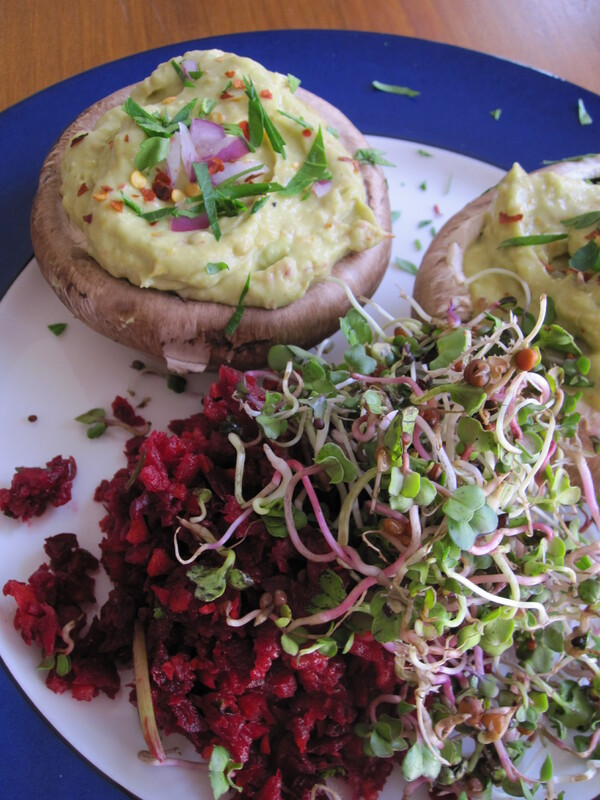 So here goes – Day 1 of 30 days doing 100% raw and this is a lovely filling tasty and EASY as meal. You can either use a small food processor to make the guacamole or you can chop and mix the ingredients by hand. If using a food processor: Combine the avocado, chili, onion, lemon, sun-dried tomatoes until smooth. By hand: Chop the onion and sun-dried tomatoes and place in a mixing bowl. Add the avocado flesh, chili and lemon to the onion and tomatoes and mix with a fork until well combined. Spoon your guacamole into the mushroom cups and serve. These are so simple and surprising extremely filling and delicious. I added a little left over Beetroot salad to my plate and a few sprouts and I have an absolute feast for lunch.